challenging for me, but that's the hidden beauty in life. Events and circumstances may come your way that are out of your control and facing each challenge helps you grow. 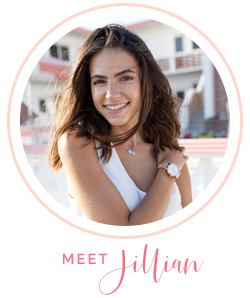 When things in my life start getting kind of overwhelming, a side of "Jillian" comes out that is nothing like the spontaneous, outgoing person that I am. I'm more reserved and to myself, I tend to shut a lot of things out than I usually do. The days have been crawling super slow since my long awaited Thanksgiving break is only a few days away. Feelings of procrastination and laziness have crept inside of me this past week and I find myself wanting to just stay at home and do the bare minimal like stay in my pj’s and lounge around….but wake up! You've gotten this far, finish strong!! Last weekend was picture perfect, I cruised across my town with the windows rolled down to pass some time and reflect on the week. To make the most out of every day resonated in my mind. It struck me how I was wasting minutes of my life throwing a pity party for myself rather than being joyful of this very day. Okay, I know it can be easier said than done, like most things. But I've found ways to help me make the most out of every day, even when things aren't going as planned. My friends and my family are my biggest support system whenever I'm feeling bummed and I know they have my best interest at heart. A meet up for some coffee with someone or a girls night can really boost your spirits for the better. Days can fly by and we all can get caught up in the same rut of going through the motions. Stop and take some time to realize how good you have it, you are here. Slow things down and really take in all that your life has given you and be thankful. 3.) Put Some Lipstick On, You Got This! Studies do say that when you look your best, you tend to do well and feel great. Honestly, this is a proven fact by me! I know you probably just want to sit around in your pj’s, but don't! Take a shower, put some makeup on, wear an outfit that makes you happy. This will affect your attitude as well as how you handle other situations, feeling more productive and confident through any day!